Our 30th state and we closed the the gap on the West. 20 new states to hit in the new year. To finish out this year we will be be back in Texas. Then we will start the new year heading back to Georgia to spend a few weeks home catching up with family and friends and doctors appointments. We will head up the East coast in February. 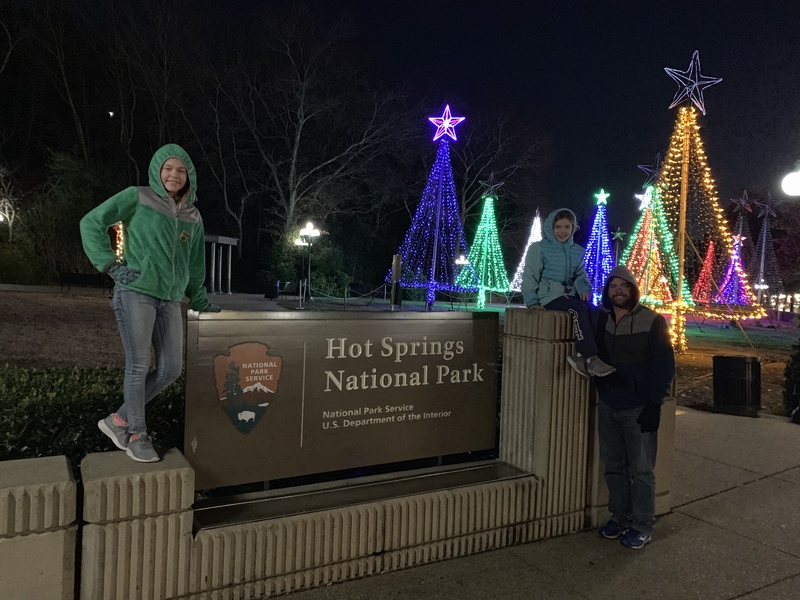 We stayed at Gulpha Gorge Campground inside Hot Springs National Park. This was a first for us, we haven’t been able to stay in a National Park because either we were to big (we are 43 ft long), they didn’t have cell service (for work) or they were booked already (Yellowstone). This is a first come first serve park with a self check in machine. We backed into a site right next to a lovely creek. This park has trails that lead to the visitors center and the mountain observation tower. We loved our neighbors that parked right next to us. We had a good laugh at the fact that we would see them out on our adventures everyday. Great minds think alike. They are from Maine and just started a one year full-time excursion. Happy Trails Linda and Henry. We enjoyed playing laser tag around the amphitheater and creek. We spent Sunday exploring the city of Little Rock, AK. We started with our typical Sunday tour of the state capitol building. Sunday’s really are the best time to visit state capitol’s. Both the outside and inside were decorated gorgeously for Christmas. Many families were taking their Christmas card pictures with the decorations as the background. Had I known I would have had us decked out in Christmas colors. Mackenzie must have known. The Arkansas capitol website has a downloadable architectural scavenger hunt geared toward middle schoolers that the girls completed. After the capitol visit we headed north to the The Old Mill for our picnic lunch. The Old Mill is famous for the opening scene in the movie, “Gone With The Wind”, made in 1939. It is believed to be the only remaining structure from the film. This three-acre site, officially known as the T.R. Pugh Memorial Park and Pugh’s Mill, is more commonly known as the Old Mill. Isn’t it a perfect backdrop for a picnic? After lunch we headed over to the Little Rock Central High School to learn more about the Civil Rights Movement. In 1954 the United States Supreme Court ruled that segregated schools were illegal with the case, Brown v. The Board of Education. It wasn’t until three years later, September 1957, that a school in Arkansas decided they were going to try to desegregate their high schools. They had a discriminating application process that resulted in just allowing nine African American teenagers to attend the all white Little Rock High School. The “Little Rock Nine,” as the nine teens came to be known, were to be the first African American students to enter Little Rock’s Central High School. This idea was explosive for the community and, like much of the South, it was met with anger and pure evil. We took the 45 minute ranger led guided tour around the school grounds. It is still an active high school with 2,000 students so you can not go inside. The girls worked on their junior ranger booklets while sitting at the reflecting pond in front of the school. After the visit to the National Park site we headed back over to the capitol to see the sculptures of the Little Rock Nine. They are on the backside of the building which we did not know about when we were their in the morning. To round out the day we spent an hour and a half in the Clinton Library. Inside the library there was a full-size replica of the Oval Office but we weren’t allowed to take personal photos while inside there. We did enjoy sitting at the table in the replica of the cabinet building. The town of Hot Springs was developed because of water- special hot water. The springs were thought to have healing properties. Bath houses sprung up and doctors started prescribing weeks at the bath houses to heal many ailments. The first bathhouses were crude structures of canvas and lumber, little more than tents perched over individual springs or reservoirs carved out of the rock. Later, businessmen built wooden structures, but they frequently burned, collapsed because of shoddy construction, or rotted due to continued exposure to high temperatures and humidity. The structures you see today were built in the early 1900’s and use the hot springs water still today. Only one on the row still offers the same experience they did back then and that’s at the Buckstaff, where we took a bath. At the park’s visitor center you can hear the story about how the 4,000 year old rainwater becomes hot spring water and how the water was used for therapeutic baths here. The park used to be the smallest national park in the system until the Gateway national memorial at the base of the Arch was completed last year. We decided that a trip to the Hot Springs would not be complete without a proper Roman bath at the Buckstaff Bathhouse that has been running continuously since 1912. They use the thermal mineral water that comes directly from a collection of 47 protected springs flowing from Hot Springs Mountain. The water starts at a average temperature of 143° as it comes down through a unique pattern of rocks and flows to the historic Bathhouse Row. The springs produce about 700,000 gallons of water per day that is then cooled and used in our relaxing bathing experience. We checked in at the desk and then were were escorted upstairs via the original cage elevator and taken to the locker room. We undressed and they wrapped us in togas and lead us into the individual bath stalls. We relaxed in the bath (they cool the water to 104 degrees for the bath) for 20 minutes then we rotated through the stations. First the steam chamber, then hot towel wrap, a stiz bath and finally a needle shower. We sipped on the cold spring water throughout our experience. Abby absolutely LOVED the whole experience, doesn’t she look relaxed. On Monday night we enjoyed watching the local city parade. The theme was Christmas Vacation. There was a great RV float from the Christmas Vacation movie. They had free cookies and hot chocolate which we needed because it was 30 degrees that night! We took the ranger led guided tour through the Fordyce Bath House. The tour starts on the first floor where the National Park Visitor Center is located. This bathhouse is not a functioning bathhouse, just a museum. In 1915 the Fordyce Bathhouse as the best in Hot Springs. This tour gives you a personal insight of the most luxurious bathhouse on the row. One afternoon the girls and I drove up the the mountain to the observation tower. Along the way we saw the green hatches that cover the springs on the Grand Promenade. There are 47 hot springs in this area. We enjoyed walking around the Main Street window shopping and looking at the all the holiday decorations. To prevent contamination the spring water is feed to fountains around town that are just consistently flowing. This water is 143 degrees Fahrenheit so I brought my tea bag and mug to get my tea on the go straight from the ground. One of the Bathhouses has been turned into a brewery that uses the thermal water to brew their beer. It’s the only brewery inside a National Park. Chris and I both did the flight of beers so we could try several different kinds. This is one of the only places in the world the public can search for real diamonds in their original volcanic source. Crater of Diamonds is located in Murfreesboro, Arkansas, about an hour from Hot Springs. The park is a 37-acre plowed field where we were able to look for diamonds and a variety of rocks and other gemstones. Any gem you find is yours to keep. You may bring your own mining equipment or rent tools from the park. We learned how to wet and dry sift from a nice guy that offered to show us after we had walked a portion of the fields just looking for diamonds to jump out to us. It was a cold rainy day so after our school work we headed over to the local science museum that was free on our ASTC membership. It turns out it is Arkansas’s largest hands on science museum. They had so many great physics exhibits, we only had an hour and half and we felt a little rushed. They have a huge parking lot and there was only one car in the lot so I let the girls do a little driving practice. We spent a day at the local library on another cold rainy day. They had story time and crafts for elementary aged children after school which Mackenzie enjoyed and met a new friend. Abby and I just sat and read. That night we ate at a local BBQ joint that was recommended. They have huge portions. How do you like my new sticker for Jeep? I thought the Jeep should have one since she is traveling the country as well.